No more hiding appliances ‘beyond the lens’! 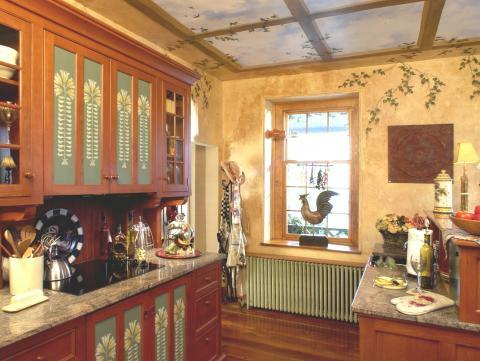 Why is it that when you see a picture of a period styled kitchen in a magazine, you rarely see any modern appliances in the photo? Why do you usually see photos of old work tables, cupboards, stone or copper sinks or perhaps a pie safe? It’s because magazine editors try to show only the parts of the kitchens in older styled homes that have no appliances to stay true to their stories. They know that a double wall oven in an 18th C. home is a visual problem. And the stainless steel range, which is located just beyond the camera’s lens really would compromise the story. So why do we continue to design kitchens containing beautifully crafted cabinetry in Old World, Shaker, Country French or even Arts and Crafts styles, and then place huge stainless steel commercial style ranges and refrigerators into the design and call it a ‘period styled’ kitchen? Are we so brainwashed by the appliance manufacturers to thinking that stainless steel is a non-style that will not interfere with our senses? Or is the status of having the latest and greatest far more important than visual styling? Or do we just get used to seeing visual hypocrisy in its truest form and after awhile, the hypocrisy fades away. After all, how often do actually notice the endless parade of telephone poles when you are driving down a beautiful country road? It is questions like these that led YesterTec to develop a system that can safely conceal all the appliances, including the ‘hot’ ones so as not to compromise the visual style of the kitchen. By concealing modern appliances, designers can control the look of the kitchen like never before without compromising the function that these technological marvels give us. The Development of YesterTec’s appliance hiding idea. One of the first forms of refrigeration that entered the home was the icebox. It looked like a freestanding, typically oak piece of furniture. Decades later, the appliance industry figured out that it would be nice to have this now very hi-tech appliance blend into the kitchen better by applying cabinet doors to it. Dishwashers soon followed suit. That left only the ‘hot’ appliances still in full view. And this is where the idea of hiding major kitchen appliances stopped dead. It was just too difficult to integrate wood cabinets around heat producing appliances in a safe, mass produced way. So instead of concealing them, the appliance manufacturers have created vintage looking appliances, retro style, super modern, and the ‘must have’ behemoths, the commercial-look stainless steel appliances, convincing designers that these exposed appliances do not compromise the design of the kitchen. But YesterTec, who was developing a concept of using furniture in kitchens instead of cabinetry, realized that exposed appliances would definitely compromise the look of their fine pieces of furniture. Their designs include Breakfronts and Armoires, even Pie Safes that house ovens, cooktops and microwaves. The designs include Cupboards that house all of the small modern appliances and Armoires and Pantries that surround huge refrigerators. All would be less effective if the appliances were exposed, so hiding the ‘hot’ appliances became a priority. Fortunately, a system was discovered that allowed the ‘hot; appliances to be safely concealed behind ‘flipper’ or pocket doors when they are not being used. Only when the doors are opened and stored in their pockets beside the exposed appliance can that appliance function, otherwise there is no power available for it. In this way, no one can operate the appliances when the doors are closed. This technology was tested and approved by Underwriters Laboratories and YesterTec patented it soon after. Key to the system is the fact that the appliances are not altered in any way, nor are they asked to operate in any abnormal way so that their warranties would remain intact. Additionally, the system allows the use of many types of appliances from various manufacturers. So now, looking back into the kitchen from the family room after all the cooking is done, you do not need to see the major appliances, only beautifully proportioned pieces of fine furniture. In fact, the kitchen can seamlessly merge with the family room like never before. 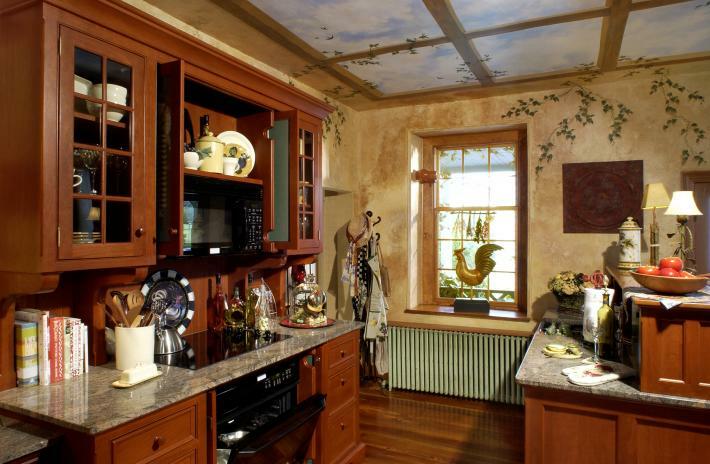 In traditional or period homes, there are fewer stylistic compromises now that the hi-tech look is concealed. And there is no functional loss at all. Finally, you can chose what you want to see, rather than being told (by the appliance manufacturers) what you must see! And the magazine photographers can finally show us the entire kitchen, uncompromised by stylistic hypocrisy! Next ArticleHeavy Timber blends a Low-Tech Look with a High-Tech Lifestyle! Previous ArticleRe-sale: This Kitchen Sold the House!